Chanteur Country US né le 25 Mars 1963 à Raleigh (Caroline du Nord). Singer/songwriter Robbie Fulks was one of the more heralded talents in the alternative country movement, displaying an offbeat, sometimes dark sense of humor in many of his best moments. While Fulks' best-known songs were often bitingly funny, he also had a gift for writing incisive and evocative songs in the country and pop traditions. As time passed, he built on the irreverent old-school twang of 1996's Country Love Songs, moving toward the tougher roots rock sound of 1998's Let's Kill Saturday Night and the eclectic, ambitious pop of 2001's Couples in Trouble. 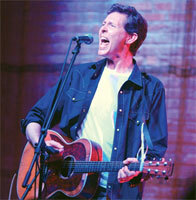 With the spare, acoustic sound and stark storytelling of 2013's Gone Away Backward and 2016's Upland Stories, Fulks received some of the strongest reviews of his career, and the latter album earned him his first Grammy Award nomination. Fulks divided his childhood between Pennsylvania, Virginia, and North Carolina, and received his schooling at Columbia University. He moved to Chicago in 1983 and first served as vocalist and guitarist in bluegrass band the Special Consensus, appearing on their Grammy-nominated 1989 album A Hole in My Heart. He later performed in the musical revue Woody Guthrie's American Song and formed his own rock band, the Trailer Trash Revue, with whom he cut a locally popular single "Little King" b/w "Jean Arthur." Fulks got his first significant exposure via Bloodshot Records' 1994 compilation Insurgent Country, Vol. 1: For a Life of Sin, which included his track "Cigarette State"; the 1995 follow-up, Insurgent Country, Vol. 2: Hell-Bent, featured Fulks' "She Took a Lot of Pills (And Died)." Both cuts were produced by Steve Albini, who also helmed Fulks' Bloodshot debut, Country Love Songs, in 1996. The album received highly positive reviews and featured backing from roots rockers the Skeletons, as well as former Buck Owens steel guitarist Tom Brumley. The follow-up, South Mouth, took a similarly retro-minded approach, drawing from classic honky tonk and Bakersfield country. With a growing cult reputation, Fulks earned a major-label shot with Geffen, but many critics felt that his 1998 label debut, Let's Kill Saturday Night, undermined the organic strengths of his previous work with overly slick roots rock production. A merger between Universal and PolyGram shortly after the release of Let's Kill Saturday Night led to a gutting of the Geffen artist roster, and the album died on the vine as Fulks found himself without a label. Fulks opted to start his own label, Boondoggle Records, distributed by his friends at Bloodshot, and launched it with The Very Best of Robbie Fulks, a facetiously titled collection of demos and unreleased recordings. In 2001, Fulks followed with 13 Hillbilly Giants, in which he covered a bakers' dozen songs of the 1950s and '60s, and later that year he issued his most ambitious set to date, Couples in Trouble, a bleak but compelling collection of original songs about a variety of failing relationships that found Fulks adding new dimensions to his interest in rock and left-field pop. In 2005, Fulks signed to the roots-oriented Yep Roc label and dug back into his country roots with his first album for the label, Georgia Hard. It was followed by the live collection Revenge in 2007. Fulks returned to Bloodshot Records, the label where it all began, with 2013's Gone Away Backward, a mostly acoustic and ballad-filled album engineered and produced by Steve Albini. In 2014, Fulks toured the U.K. with veteran punk/folk upstarts the Mekons; while in Scotland, he and most of the Mekons recorded a loose album of bent sea shanties and folk pastiches. Titled Jura, the album received a vinyl-only release through Bloodshot for the 2015 Black Friday Record Store Day celebration. The LP quickly sold out, and Bloodshot gave the album a wider release on CD the following year. In 2016, Fulks returned with Upland Stories, another primarily acoustic set recorded with Steve Albini at the controls. In 2018, Fulks joined forces with Linda Gail Lewis for Wild! Wild! Wild!, a rollicking set of old-school country, hillbilly boogie, and rockabilly.